Without doubt a great stay to the hotel! Children (3yrs and 6yrs) enjoyed the stay as well. Upon arrival we were warmly welcomed by Ms Elisavet who was extremely friendly and deserves a special thanks for the hospitality. We had two great evenings here, which added up to the experience. The hosts are beautiful, very helpful and friendly. We were pleasantly surprised when we received some local produce present at the end of our stay. The breakfast was amazing and generous. It was homemade and a great selection of the local produce. We sat on the balcony while enjoying the view. The garden is a great place to hang out and let your dog run. The beach is good to walk along in the morning with your dog or if you fancy some jogging it is perfect. It is a good place to go in summer! The room was very clean and it was thoroughly cleaned daily. The views from the property are great. The hosts are nice people. The beds were fine. This property would have been good value-for-money in a quiet location. REAL WELCOME WITH A BIG SMILE! Mrs. ELLE & Mr. MANOLIS, ARE THE BEST HOUSEHOLDERS EVER! ALWAYS AVAILABLE WITH A BIG SMILE, TO SERVE ANY OF OUR NEEDS! THE SEA VIEW IS SPECTACULAR, THE ROOM VERY CLEAN AND THE SERVICE EXCELLENT. PERFECT BREAKFAST AND ADOPTION TO ANY SPECIAL INQUIRY. THANK YOU SO MUCH FOR MAKING OUR STAY IDEAL! WE SHALL COME AGAIN! A great place to stay. The location is very clean and is close to the beach. It is a very relaxing place in wich you feel like at home. The host is very nice. A simple and nice apartment, very close to the beach. The hosts made us feel like at home. Delicious breakfast with homemade bread and preserves. Очень приветливые хозяева! Несколько раз в неделю нас угощали свежей выпечкой и домашними оливками. Чистота идеальная, уборка два раза в неделю. Пляж через дорогу. Удобная парковка на территории, большой балкон, чудесный сад. Есть все необходимое: кондиционер, холодильник, плита, посуда, сетка для защиты от комаров (и котов), жалюзи. Хорошее расположение для путешествующих на автомобиле: 7 км. до красивейшей деревни Лимни и около 20 км. до курорта с лечебной водой Лутра Эдипсу. Το δωμάτιο ήτανε εντυπωσιακά καθαρό, ευρύχωρο, φωτεινό, πλήρως εξοπλισμένο και δίπλα στην παραλία. Το πατάρι με δύο στρώματα, διακοσμητικά το βρήκα πολύ όμορφο και σίγουρα τα παιδιά θα το απολαύσουν. Το μπαλκόνι είχε υπέροχη θέα, ικανοποιητικό μέγεθος με μεγάλο τραπέζι και, πράγμα όχι και τόσο συνηθισμένο, προσέφερε πλήρη ιδιωτικότητα από τα διπλανά διαμερίσματα. Η οικοδέσποινα, κα Έλλη, ήτανε εξυπηρετικότατη, ευγενική και η προσωποποίηση της καλοσύνης. Αν και στις παροχές μας δεν συμπεριλαμβάνονταν πρωινό, στο δωμάτιο υπήρχαν φρέσκος καφές και ζάχαρη και το πρωί μας προσέφερε φρεσκοψημένο ζεστό κέικ. Η σχέση ποιότητας – τιμής πραγματικά ξεπέρασε τις προσδοκίες μας. Nos hôtes ont été très accueillants avec quelques petits mots de français, généreux, extrêmement serviables et toujours disponibles . Le petit-déjeuner est excellent,copieux, varié,entièrement fait maison et servi dans la chambre sur un grand plateau. Nous avons aimé la décoration simple et élégante. 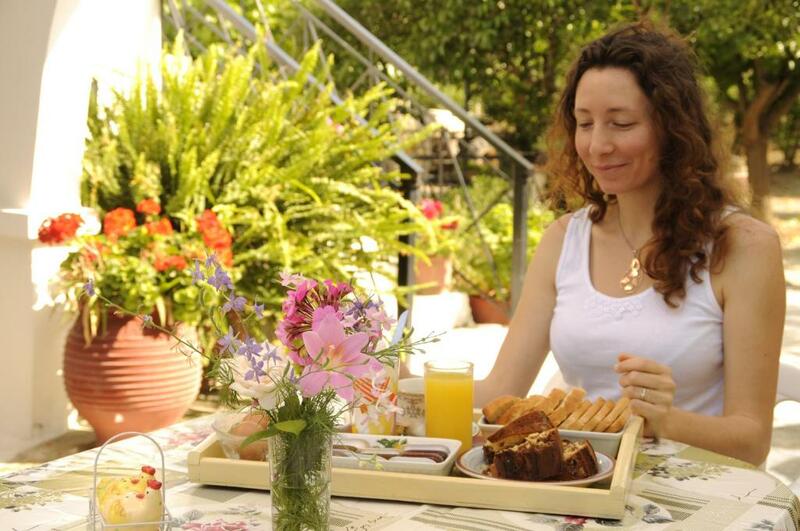 Lock in a great price for Heracles Guesthouse – rated 9.2 by recent guests! One of our best sellers in Rovies! 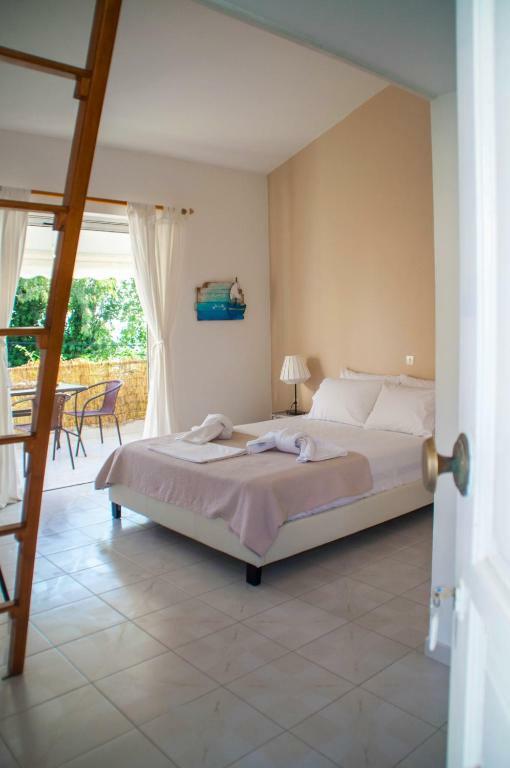 Located in Rovies, 200 feet from Heracles Beach, Heracles Guest house features a terrace and views of the sea. All units feature a TV. There is also a kitchenette, equipped with an oven, refrigerator and stovetop. Towels are provided. The property also offers special diet menus. Church of Osios David Gerontou is 3.7 mi away. The nearest airport is Athens International Airport, 114 mi from the property. When would you like to stay at Heracles Guesthouse? This studio features a sea view, private entrance and air conditioning. 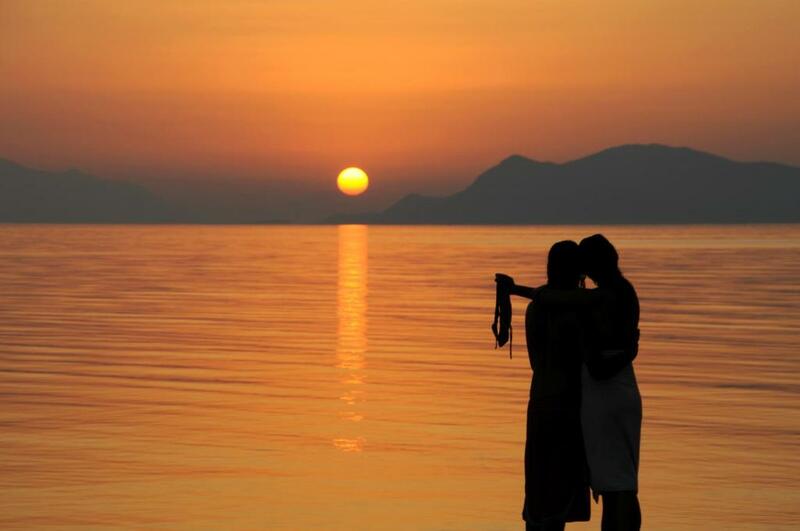 Heracles guesthouse is located in North Evia by the beach "Heracles" (Hercules). All of the rooms have a view to the sea and the sunset! Just 50 meters below your room you can swim at the sea and get a drink at the local beach bar! My name is Elisavet! I was born in the village Rovies (1 km from our guesthouse) and I have spent all of my life at the countryside. I love working in nature. I spend my free time taking care of my flowers, walking by the sea, gathering wild plants on the hill and staring at the natural beauties, such as sunshine and sunrise. I also love cooking! I cook twice a day and I like discovering local recipes for sweets and sharing them with my guests. Heracles Guesthouse is located between Rovies and Limni village, 1 km from Rovies and 9 kilometres from Limni. 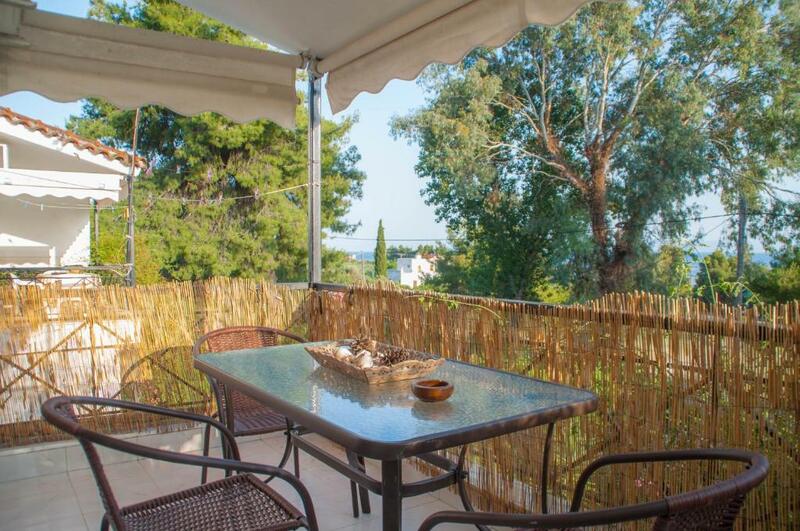 The property is surounded by a pine forest with only 4 houses in a 300m distance. If you cross the street then you arrive at the beach "Heracles". It is a big beach with calm, clean water, a few fisherboats, beautiful pine trees and a beach bar. In Rovies you can find a variety of small stores with local products such as wine, honey, olives, olive oil and fresh grocery. At the beach of Rovies, you can try fresh fish and greek cuisine in tradinional taverns such as cafes and bars with umbrellas on the beach. The area is quite calm, even during the touristic period (July-August). House Rules Heracles Guesthouse takes special requests – add in the next step! Please note that children under 3 years old have breakfast free of charge. Kindly note that baby cots can be provided upon request. Please inform Heracles Guesthouse of your expected arrival time in advance. You can use the Special Requests box when booking, or contact the property directly using the contact details in your confirmation. In cold months, I would ask the host to heat up the room, so when guests arrive is all cosy and warm. A bit too small for three people, but the host ensured as much comfort as they could offer. The worst thing of our stay was the traffic noise inside and outside the room. The property is just on the main coastal road of Northern Evia, which in this area is a high speed and very busy road, meaning that you hear cars and trucks continuously passing by at about 80 km/h or more, day and night. Practically you do not get 15 seconds of silence even with all doors closed (no soundproofing). Even with earplugs I could still hear the same while in bed. For us it was a disaster because we needed a quieter place and did not know that this road was so busy and noisy. However the hosts and other guests seemed undisturbed, with an older couple on the next balcony listening to serene, elitist jazz works which intermingled strangely with loud traffic noise… The bathroom facilities need an update. For example in order to properly (read fully) flush the toilet one need to use a large basin (already available in the bathroom). There is a kitchenette but the cooking space is very small if you need to cook several days.